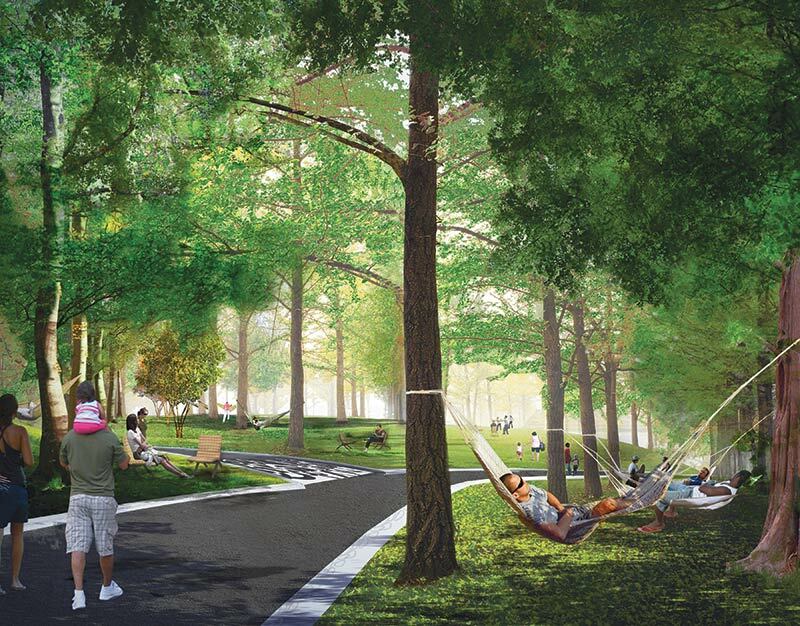 The first phase of construction efforts to transform Governors Island from a Coast Guard base into a public park has been underway since May, racing toward an expected completion by the fall of 2013. Designed by Dutch landscape architecture practice West 8 with contributions from local firms MNLA, Rogers Marvel Architects, and Diller Scofidio + Renfro, the makeover focuses on altering a once closed and militarily regimented environment into one that encourages visitors to explore, interact, and claim the grounds as their own. The first phase includes the restoration of many of the historic buildings on the island as well as the construction of 30 contiguous acres of new parkland. This includes Soissons Landing, the long-time ferry dock by which visitors will access the island; Liggett Terrace, a patio tucked into the embracing wings of the McKim, Meade & White–designed, neo-georgian Liggett Hall; Hammock Grove, an undulating forested area; and the Play Lawn, an 11-acre grassy field for sports and sunbathing. The alterations being made to Soissons Landing and Liggett Terrace are relatively straightforward from an engineering and construction point of view. The ferry dock is being made more inviting with the addition of shade trees and mosaic paving. Visitors will be greeted by the opportunity to take a spin on free bicycles. Signage by design firm Pentagram will make it clear which way to go to find what. 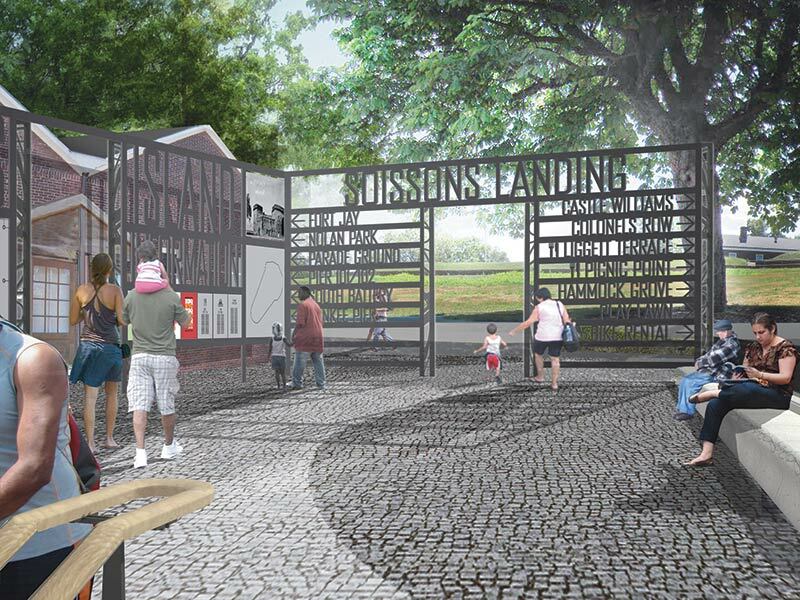 Restrooms, concessions, and other amenities are being integrated into the historic structures that surround the landing. Liggett Terrace will capitalize on the sheltering aspects of the existing architecture and will feature more mosaic paving as well as flowerbeds and café seating. Things get more interesting at Hammock Grove and the Play Lawn. The first step in the process of turning this old military marching ground into a lushly planted zone of verdant grasses and nut-bearing trees is ensuring a supply of fresh water, not to mention good soil. While much of Governors Island is a mound of solid granite, much like Manhattan, this southern portion is composed of landfill. Dig a hole just a few feet beneath the surface and it will begin to fill with brackish water from the harbor—not an ideal condition for supporting the 55 species of trees from the oak-hickory forest family that will occupy the grove. West 8 solved this problem by raising the level of the island. In part this is being accomplished with fill made from the rubble of the island’s demolished structures. The other part is lots of good quality topsoil, bought on the market and imported to the site to serve as the park’s chief growing medium. This solution also allowed the architects to sculpt the landscape, creating undulations in the earth that frame selected views, such as to the Statue of Liberty, or to Lower Manhattan. In a future phase of construction, fill will be used to sculpt high hills from the top of which visitors will be able to obtain 360-degree views, ascertaining once and for all that they are indeed on an island. All of this new planting will require irrigation. Governors Island is being linked to the city’s water system with a pipe from Brooklyn as part of this first phase of construction. In part, that potable water will be used to feed the thirsty fledgling plant life, which will take a generation to reach maturity. But West 8 is also employing good storm water management practices that will ensure that the rain that falls on the island will remain in its soil to feed the greenery, rather than be directed out into the harbor via sewers. Permeable catch basins throughout the site will collect storm water and feed it slowly into the deep soil, where, thanks to hydrological phenomena, it will form a separate stratum from the underlying seawater.